As the saying goes, "a picture is worth a thousand words". The rise of the visual Web has made this proverb more meaningful than ever. There are now more than 5 trillion images online, with 500 million new ones being uploaded and shared every day. The emerging field of image-based advertising takes advantage of this photo-centric world by delivering contextually relevant ads that reach consumers when they are actively engaged in exploring content. This revolutionary form of advertising brings major technological challenges, particularly with respect to the development of algorithms that enable computers to understand and classify images. Advertisers should take advantage of federal R&D tax credits to support their efforts to create new and improved programmatic image recognition solutions for in-image advertising. A recent study by comScore revealed that 54% of online ads are not viewable. The remaining ones, which can technically be seen by consumers, are largely ignored, in a phenomenon known as "banner blindness". Proof of that is the steady decline of key engagement metrics for traditional display advertising formats, such as click-through rates (CTRs). 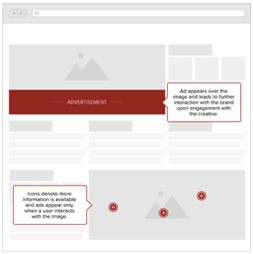 In this context, image advertising stands out as a meaningful alternative to standard display units. 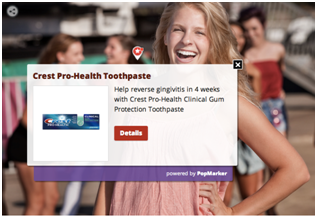 Considered the next generation of digital display advertising, such ads appear directly over an image on a webpage. Because they are in-line with editorial content, in-image ads reach consumers where their attention is already focused, enabling higher viewability and positive user experience. Display overlays often take the form of an ad strip at the bottom of an image. They capitalize on the time a viewer's attention is focused on the picture, therefore constituting an important alternative in the combat of banner blindness. Embedded links within an image can convey more information about the items portrayed and send consumers directly to marketers' websites. In other words, images become "shoppable". 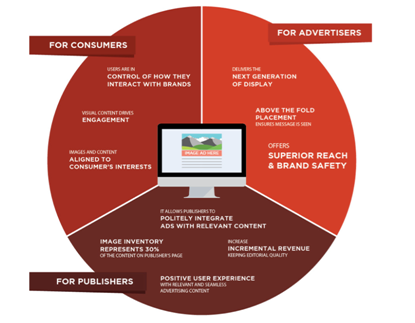 Source: Interactive Advertising Bureau, In-image Advertising Primer, March 2014. In-image advertising targets ads according to the meaning of the photos over which they appear. Considered a form of "native advertising", they are relevant for consumers, which perceive them as being polite and additive to the viewing experience. According to in-image advertising company GumGum, image-based ads drive 700% higher engagement rates than standard banner ads, with CTRs between .3% and .5%. Their ability to positively impact key brand metrics, such as awareness and purchase intent, is also outstanding. The Nielsen Online Brand Effect studies have shown an average 37% brand lift for image-based campaigns aimed at driving brand awareness, almost three times the industry average. A recent study by DoubleVerify, provider of digital performance solutions, analyzed more than two dozen in-image campaigns and found that average viewability was 77%, 51% higher than traditional display advertising benchmarks. Image-based advertising represents a win-win-win opportunity for advertisers, publishers, and consumers. Advertisers capitalize on consumers' expressed interest for a certain content to deliver contextually relevant messages, targeted at more receptive and engaged viewers. In-image advertising has enabled the overcoming of traditional display ads' stagnation, driving major improvements in performance indicators. Furthermore, it has allowed marketers to take advantage of a considerable portion of online real estate, which had long been a blind spot. Images account for one-third of the content on publishers' pages. Through image-based advertising, publishers can generate revenue from previously unmonetized portions of their websites. In other words, it is a new vehicle for brand dollars to flow into the online space. Finally, in-image ads are contextually relevant and therefore aligned with consumers' interests. They preserve the user experience, giving readers control over brand interaction. This greatly beneficial scenario explains the rapid expansion of this new segment of display advertising. Potential for growth is huge, particularly when considering the $7.5 billion banner advertising market to pursue. Rich media, video, sponsorship, and search can also eventually be captured by image advertising, which would then represent an even larger share of the $36.6 billion digital advertising market. Venture investment in image advertising is at an all-time high. Pioneer of the in-image advertising concept, GumGum has received $10.8 million in venture funding, with $7 million coming from New Enterprise Associates on October 2012. Piqora, a marketing platform and analytics provider for the visual Web, has recently raised $7.7 million in Series A funding for technology aimed at understanding how people react to photos, including those on social networks. This investment brings the company's total funding to $11 million. With 6 billion monthly image views, Luminate has also received significant investment. It raised $10.7 million in Series C funding led by Nokia Growth Partners with participation from existing investors, such as Google Ventures. 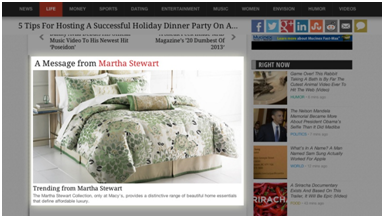 Native advertising technology startup TripleLift is yet another example. The New York-based company raised a $4 million Series A round led by True Ventures last March. The expansion of image-based advertising poses significant technological challenges. In recent years, we have witnessed the development of computers' ability to read texts, which has paved the way for the multimillion-dollar business of online search advertising. Similarly, the goal is now to teach computers how to read images. Computer Vision: also known as programmatic image recognition, consists of computers inferring the meaning of images. Semantics Analysis: uses meta data, files names, information entered by the photographer, along with keywords from the page content to determine what images are about. Human Classification: happens when people review and enter information about the meaning of images. Though highly accurate, human classification is not scalable and therefore inadequate to handle the massive inventory of online images. Thus the importance of algorithms that enable computers to understand and classify pictures for ad targeting. Such software must be able to classify images to ensure brand safety, scan pages for relevant keywords, and automatically adjust to updates and modifications. A growing number of advertising companies are engaged in innovative efforts aimed at developing new and improved image recognition solutions. GumGum's patent pending algorithm, for instance, evaluates the pixels of images and uses face recognition and image clustering to identify people and objects. Headquartered in Mountain View, CA, Luminate claims a new concept of "ad experience" largely based on software analytics. The company's patented ImageWords technology identifies people, brands, mood, and more from an image and turns them into targeting keywords for advertising. Provider of image-based software applications, Glen Cove-based PopMarker is an interactive in-image advertising platform for publishers and advertisers. The company recently received the Long Island Software Award in recognition of its state-of-the-art interactive applications that allow consumers to shop, surf, comment, and network directly from an online image. PopMarker's patent pending image recognition and tagging platform was designed to revolutionize the way images were traditionally used on the Web. Reaching 150 million unique visitors per month, PopMarker gives access to the content inside images, or 30% of the Web that was previously inaccessible. The company's robust application automatically recognizes hundreds of specific products on photographs, which are then tagged for advertising. Beyond image recognition and classification capabilities, companies have also developed innovative ways to increase convenience, effectiveness, and speed in the complex world of digital, image-based advertising. With offices in New York, Chicago, and Los Angeles, TripleLift is at the forefront of native ad innovation. The startup has achieved the unlikely combination of programmatic buying and native advertising, in other words, automation and customization. TripleLift's innovative technology automatically takes a brand's image and makes it look and feel like the content on a given website. In addition, the company's real-time bidding system enables brands to buy ads at scale and programmatically, automating the distribution of sponsored content. Based in San Francisco, CA, Pict enables brands to create their own shoppable photos via a Web and mobile application. The so-called "PICTs" are then uploaded into a platform of monetizeable images for publishers. All photos are trackable and yield insight into which ones generate the most revenue and drive the most engagement. The application also allows for direct synchronization with online stores and product feeds, guaranteeing real-time update of pricing and information. Images resonate with consumers, drive curiosity and, most importantly, captivate attention. In-image ads are an innovative way to capitalize on the rise of the "visual Web" while overcoming the stagnation of traditional formats of display advertising. The development of innovative image recognition software has enabled the scalable and programmatic use of this previously inaccessible and unmonetized share of online content. Image advertising companies engaged in the creation and improvement of computer vision algorithms and related applications should take advantage of federal R&D tax credits to support their innovative endeavors.